WIth mountain bike orienteering (MTBO), getting lost is half the fun! It’s a MTB race. But where’s the course? Imagine being in an unmarked mountain bike race course where all your competitors are someplace else. Are you lost…or are they? Maybe neither of you, since you started at different times. You’ll discover who was faster at the finish! The best mountain bike orienteers start out as exceptionally fast MTB specialists. 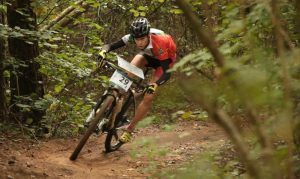 If you’re a competitive aging mountain biker, navigation might be the perfect add-on to slant the playing field back in your direction again. After all, good navigation is about thinking ahead, balancing route trade-offs, and using that pre-frontal cortex that wasn’t fully developed back when you were at your cardio max years ago. And if you’re at your speed prime, this is a whole new level of competition. Instead of barreling down a path with a herd of dust-throwing speedsters, now you can be just as fast or faster with the trails to yourself–as long as you’ve chosen the right set of trails to get to your next checkpoint. It’s like MTB time trials for smart people. Enough practice, and you’ll be showing up those greying athletes who keep bragging about superior brain development. Even with good route choice, you’ll still be physically overcoming obstacles. And you’ll know in advance. So what exactly is a course? A course is a set of these checkpoints, distributed all over a park or other area with lots of trails. The checkpoints (called controls) can be manual, with a punchcard that you clip at each control, or they can be electronic, with a thumb-mounted e-punch that you stick into the control to record your time. If the punches are electronic, then you’ll also get a print-out at the finish, telling you to the second how long it took to complete each section of the map. Before you know it, you’re discussing route choice post-race with competitors, joining in the camaraderie of orienteers who view each race as an opportunity to hone their navigation skills. 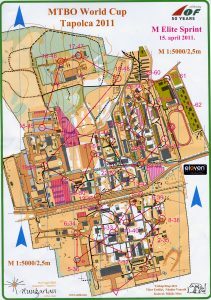 At the start, you’ll get an orienteering map like this, at a scale of anywhere from 1:15,000 (distance) to 1:5,000 (sprint)–and you’re off and riding! The circles tell you where the controls are, the lines tell your general direction, and the paths give your options for how to get from one to another. Avoid the blue marshes! MTBO is done the same all over the world, making it a great way to see different terrain and participate in fellow MTB communities in other countries. Unlike other MTB races, trails in MTBO events are often multi-directional. Chance of collision is low, though, for two reasons. First, course designers design courses with a particular flow that keeps cyclists going in the same general direction. And second, there’s not a frantic (and dangerous) peleton of riders taking up the entire trail. If you do cross paths with someone, it’s like meeting another MTB rider out in a park on non-MTB trails. You don’t even need woods and a trail network for an MTBO event. This world cup event was held in an urban campus environment. All of which brings us to elite competition. Every year, the best MTBO athletes in the world compete for a world title. The US has traditionally not been a strong presence–ironic, since the MTB was invented in the US–but Europe and Australia are powerhouses. See the plans for this year’s world championship at http://www.wmtboc2018.at/wmtboc2018/. 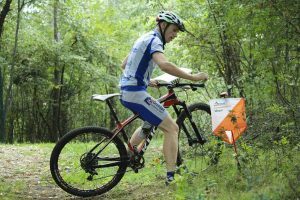 This year’s World MTB Orienteering Championship is in Austria. 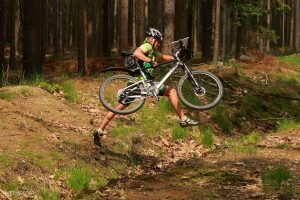 Want to do mountain bike orienteering? 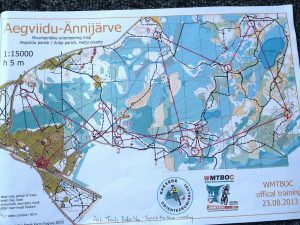 In most cases, it’s easier than setting up a conventional (foot-based) orienteering event, because the map requirements are simpler. You often don’t need detail about the type of vegetation in he woods, or the point-features such as boulders in it, because bikes aren’t going there. You just need a really good map of a complex trail system or campus environment where bikes can go fast and there are plenty of opportunities to make both good and bad navigational decisions. A Google Maps view of your favorite biking is a great starting point. From there, we can recommend free software for creating an event-quality map for your event and the course of checkpoints built on top of it. Just contact us! And your local orienteering club can also be a useful resource for event planning. What do planes and bikes have in common? New shipment: Which bike is right for you? See The Convenient Cyclist blog.